These FAQs help manufacturers comply with the Energy Labeling Rule, which includes the Lighting Facts label. It has information to help consumers choose the most energy-efficient bulb for their needs. 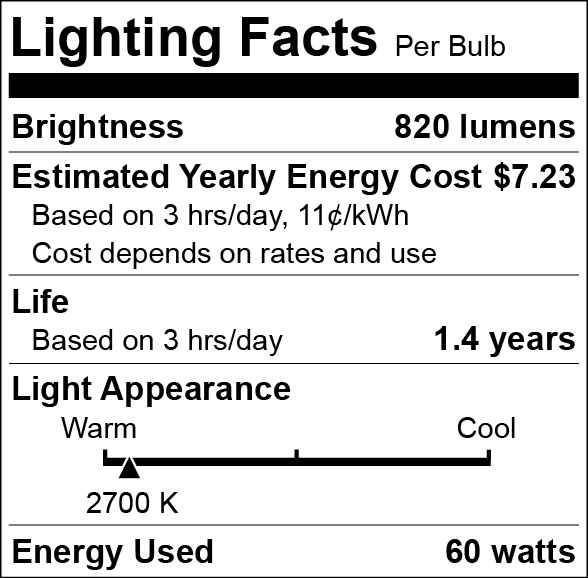 The Energy Labeling Rule requires light bulb manufacturers to give consumers key information in an easy-to-read format. 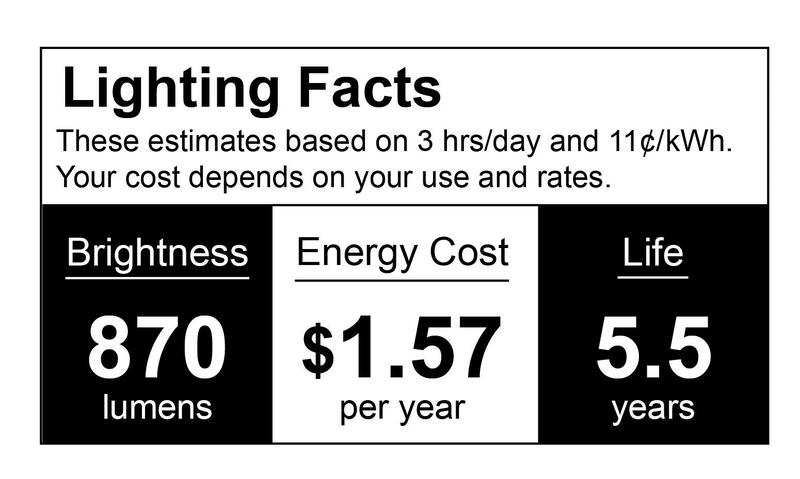 The Lighting Facts label gives shoppers the information they need to buy the most energy-efficient bulb to meet their lighting needs. The label includes a bulb’s brightness, energy cost, life, light appearance, and wattage. In addition, the principal display panel on the front of packaging focuses on lumens, a measure of brightness, rather than on watts, a measure of the amount of energy used, and includes the estimated yearly energy cost for each bulb. Bulbs themselves also feature lumens, and in the case of CFLs, a mercury disclosure. The FTC enforces the Energy Labeling Rule. To help you comply with the labeling and reporting requirements for common household light bulbs, FTC staff have prepared answers to some common questions we’ve been asked. Which general service lamps must have Lighting Facts labels? What information must appear on the principal display panel for a general service lamp? What information must appear on the Lighting Facts label for a general service lamp? What information must appear on the general service light bulb? What can I do if the package for my general service lamp is too small to hold the Lighting Facts label? What are specialty consumer lamps? Which Lighting Facts label must appear on packages for specialty consumer lamps? What can I do if the principal display panel for my specialty consumer lamp package is too small to hold the Lighting Facts label? What should I do if a specialty consumer lamp contains mercury? Where can I get a copy of the labels to use on the packages I manufacture? What test procedures must I use to support the content of my Lighting Facts label? May I use a bilingual label? Do labels need to be approved by the FTC before they’re placed on products? May I add information to the Lighting Facts label? Am I required to post copies of the Lighting Facts label for my products online? What information do websites and catalogs that sell general service or specialty consumer lamps need to include? What are the Rule’s reporting requirements for covered lamps? Can I use the Lighting Facts label for lamps that are not covered by the Rule? The FTC Lighting Facts label and principal display panel information must appear on packaging for most general service “lamps” with medium screw bases, including most incandescent, compact fluorescent (CFL) and light-emitting diode (LED) light bulbs. The Energy Labeling Rule has several exceptions for various lamp types, so it’s a good idea to review specific definitions for answers about coverage. See 16 CFR § 305.2 and § 305.3. See 16 CFR § 305.15 and Appendix L.
See 16 CFR § 305.15. If the total surface area of the product package available for labeling is less than 24 square inches, and the package shape or size cannot accommodate the standard label, you may provide the information using a smaller linear label. See 16 CFR § 305.15. Specialty consumer lamps include most lamps with a medium screw, candelabra screw, a GU-10, or GU-24 base and a lumen range between 310 lumens and no more than 2,600 lumens, or a rated wattage between 30 and 199. The term does not cover any lamp that qualifies as a general service lamp. The Energy Labeling Rule has several exceptions for various lamp types, so it’s a good idea to review specific definitions for answers about coverage. See sections 305.3 and 305.15 of the Rule for details about the coverage. Manufacturers may use the Lighting Facts label required for general service lamps or the smaller version of the Lighting Facts label for most specialty consumer lamps, as long as it appears on the principal display panel. However, a specialty consumer lamp that is a vibration-service lamp, rough service lamp, appliance lamp or shatter resistant lamp must use the Lighting Facts labels (and follow all other requirements) applicable for general service lamps. If the required disclosures (i.e., either the abbreviated specialty bulb disclosure or the standard general service lamp label) would not be legible on the front of a single-card blister package due to its size, you may use a smaller label on the principal display panel that says “See Back for Lighting Facts,” and include the full Lighting Facts label on the back of the package. You must also label the lamp legibly with this statement: “Mercury disposal: epa.gov/cfl” in minimum eight point font. The FTC offers templates you can use to create Lighting Facts and principal display panel labels. You must ensure that you enter the correct data for your products. If you have signed a Memorandum of Understanding with the Department of Energy or the Environmental Protection Agency, you may use labels with the ENERGY STAR logo, but only on certified models listed on the ENERGY STAR website. See Energystar.gov for more information. You must use Department of Energy (DOE) test procedures for any lamps (e.g., general service lamps), covered by those procedures. You may find them here. See 10 CFR Part 430, 10 CFR Part 431, and 10 CFR § 429.11. If a lamp is not covered by DOE tests, you must have competent and reliable scientific evidence to support the representations you make on the required label. See 16 CFR § 305.5.
using a bilingual label that shows the English text in the format required by the Rule, immediately followed by the text in the second language. Here is a sample of a bilingual label. All the required information must appear in both languages, but you don’t need to repeat numeric characters that are identical in both languages. The amendments don’t allow a trilingual label. See 16 CFR § 305.15. No. The Rule doesn’t require you to get FTC approval before you label and sell the products. However, you must meet the FTC reporting requirements before you distribute products that are covered by the Rule. You also must comply with the Rule’s testing requirements. See the previous question: What test procedures must I use to support the content of my Lighting Facts label? No. The Lighting Facts label may not include any marks or information other than those specified in the Rule. See 16 CFR § 305.15. If you are a manufacturer of general service lamps or specialty consumer lamps covered by the labeling requirements, you must post images of the Lighting Facts labels for the products on a publicly available website so website retailers can hyperlink to the labels or download them. The label for each model must remain on the website for six months after production of that model ends. See 16 CFR § 305.6. A manufacturer, distributor, retailer, or private labeler who advertises a general service lamp on a website or in a print catalog that contains the terms of sale, retail price, and ordering instructions for consumers, must disclose clearly and conspicuously, on the page listing the lamp, an image of the Lighting Facts label. The labels must be clear and conspicuous, and appear in close proximity to the lamp’s price on each page that contains a detailed description of the lamp. For specialty consumer lamps, this requirement goes into effect on May 2, 2018. For more information about these requirements, see 16 CFR § 305.20. The Rule requires reports for general service incandescent lamps and CFLs. It does not require reports for general service light-emitting diode (LED or OLED) lamps or specialty consumer lamps. See 16 CFR § 305.8.
by March 1 every year for models in current production. See 16 CFR § 305.8. You can submit the reports required by the FTC through the Department of Energy’s Compliance Certification Management System (CCMS) at regulations.doe.gov/ccms. The reports must contain the same content the Department of Energy requires under its certification rules. See 16 CFR § 305.8 and 10 CFR Part 429. Yes. You have the option to use the Lighting Facts label on lamps that do not meet the definition of general service lamp or specialty consumer lamp, as long as you comply with all the Rule’s requirements for specialty consumer lamps.